The annual Plastic Industry Awards took place on Friday 28th September at the prestigious London Hilton on Park Lane. Celebrating its 18th year, the ceremony gave the opportunity to honour outstanding achievements, developments and contributions to the plastic industry across the nation. As part of the celebrations on the night, there was a charity casino which was open to attendees after the awards ceremony. 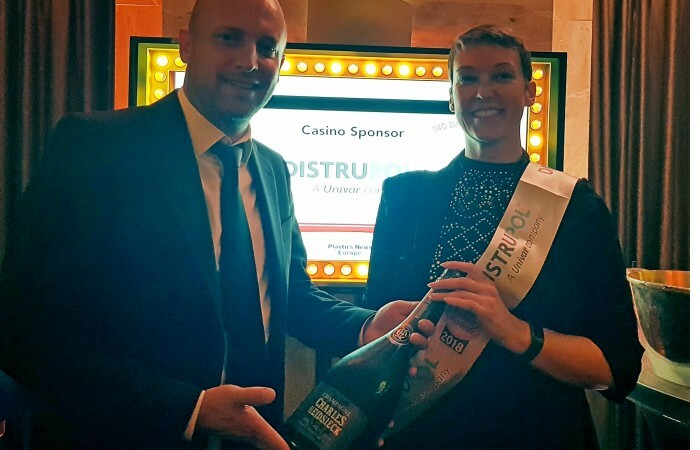 Sponsored by Distrupol, the casino raised money through ‘donations for chips’ for The Prostate Project – a charity which raises money and awareness for those diagnosed with prostate cancer. The charity is very close to Distrupol’s heart, after losing their MD, Gerry Moore, to the illness back in 2016. The casino raised a fantastic £1,000 on the night, which was a great success and one that Colin Stokes – who established the charity and was in attendance on the evening – was very proud of. Thank you to everyone involved with the fundraising, and a special thank you to Crain Communications for organising the event.